Oaklins DeSilva+Phillips’ client, Collectors Weekly, a subsidiary of Quizlet and one of the world’s largest websites devoted to antiques and collectibles, has been sold to Barnebys, the leading global search engine for design, antiques and art. It is Barnebys’ second U.S. acquisition in just two weeks. The prior week, the company bought Simple Auction Site in the US. Based in San Francisco, Collectors Weekly lists hundreds of thousands objects in almost 2,000 collecting categories, and the site attracts roughly one million visitors every month from all over the world. In addition to its deep auction listings and vibrant community of collectors, Collectors Weekly specializes in original editorial content in the form of essays, interviews, and long-form articles. “We are thrilled to be a part of Barnebys,” says Ben Marks, who has been with Collectors Weekly since 2009. “Barnebys really understands that original content is an important complement to any online auction environment.” Combined with the acquisition of Simple Auction Site just two weeks ago, the acquisition of Collectors Weekly gives Barnebys an increased footprint in the U.S.—Barnebys’ largest market—as well as a unique set of synergies that promise to accelerate the company’s already aggressive expansion and growth. “Both these recent acquisitions, Simple Auction Site as well as Collectors Weekly strengthens our client base enormously and beefs up our opportunities for 2018”, says Christopher Barnekow, Founder and CTO of Barnebys. This latest acquisition is funded through new investments from two new Barnebys shareholders—Jens von Bahr, founder of Evolution Gaming, and Jonas Engwall, a private investor. Barnebys was founded in 2011 by Christopher Barnekow, Pontus Silfverstolpe, Gustaf Grapengiesser, and Christofer Ferreira Gomes. Today, Barnebys has approximately two million visitors a month on websites in eight markets. An Italian version of Barnebys was launched in late October 2017. As seen in its recent acquisitions, the company’s business model is based on attracting a range of consumers, from seasoned auction-goers to new generations of buyers and sellers who trust Barnebys to connect them to the company’s affiliated and vetted auction houses and dealers. Indeed, that’s why Barnebys has become the main source of traffic for a majority of affiliated auction houses and dealers. In total, approximately 800,000 unique items are listed daily on Barnebys from 3,000 auction houses, as well as from art, design, and antiques dealers. Barnebys is managed by its founders with external funding. Among the investors are Industrifonden, Active Venture Partners, Inbox Capital, Howsat, and Monkfish. The last two companies also contribute their market intelligence based on their experience in building two of the world’s most recognized and popular meta-search services, Momondo and Trivago. 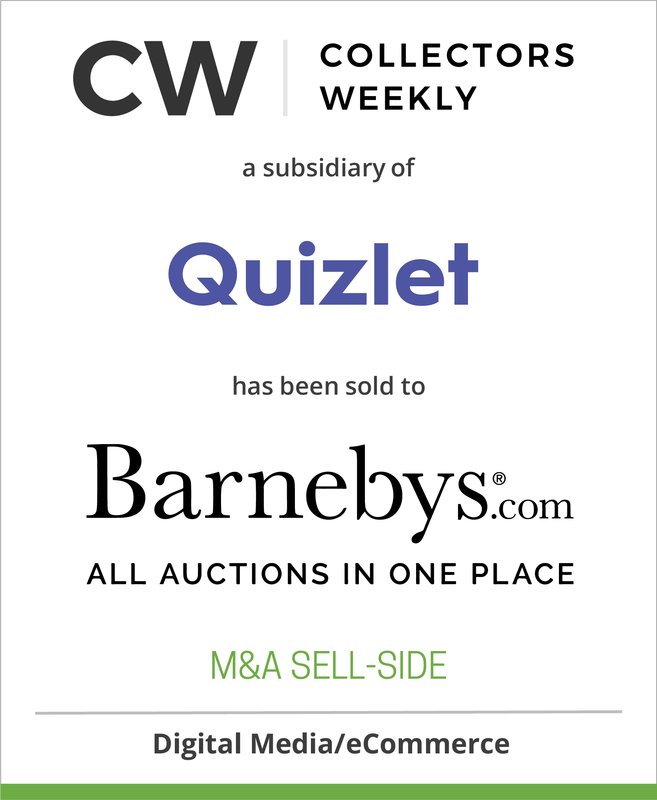 Client Collectors Weekly, a subsidiary of Quizlet Inc.